Dominion is made from a fuzzy, golden yellow material with black button eyes and stitched nostrils. He has two large, brown antlers on top of his head and brown hooves. On his chest are the words “Canada Day ’04” embroidered in red thread underneath a red maple leaf. Have a nice Canada Day! Dominion was released on 2nd June 2004. His birthday is on 1st July 2004. Dominion was exclusively available from the Ty online store. 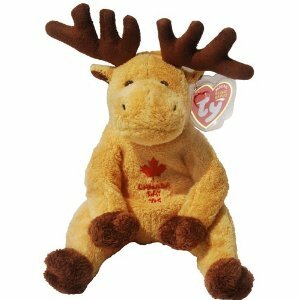 He was made for Canada Day 2004. He was retired on 2nd August 2004.